the excellent manoeuvrability of our bandages and their high level of lamination, the final result will be nice and smooth while still rigid or semi-rigid enough to reduce the patient’s range of motion. Nemoa ElastiCast is a light-weight, strong and mildly flexible elastic rigid synthetic plaster bandage. It is made of 100% polyester, impregnated with polyurethane resin. Each roll is hermetically packed. Available in several colours. 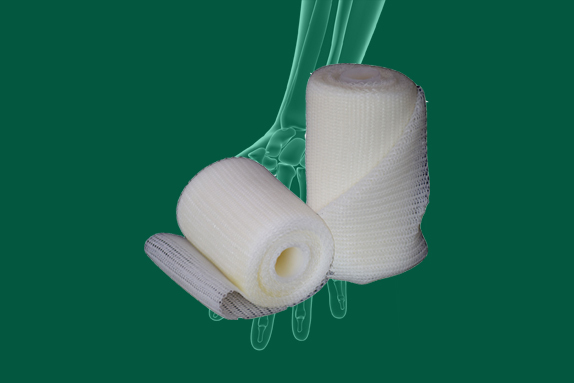 Nemoa™ Flex is an innovative, light-weight and strong semi-rigid synthetic plaster bandage. It is made of 100% polyester, impregnated with polyurethane resin. The finished product is semi-rigid and extremely smooth. Each roll is hermetically packed. Available in several colours. Nemoa™ Splints are available in a roll or as pre-cuts. Both types of splints are ready for immediate use, without any need for gloves, cotton wool or stockinette. They are made of 100% non-woven polyester material impregnated with polyurethane resin. Rolls come in resealable airtight wraps stored together in a handy box. Nemoa™ pre-cuts are individually hermetically packed and come in a box of five. Nemoa™ Ever Fresh is a unique, water-resistant tube-shaped bolster material which can be applied under synthetic plaster bandages. Since this bolster material is water-resistant, it can be used in a plaster application suited to allow the patient to bathe and swim (if required).